The weaning process can be incredibly daunting, with different schools of thought on when to start, what to give, how much to give. You have to go with what makes sense to you. 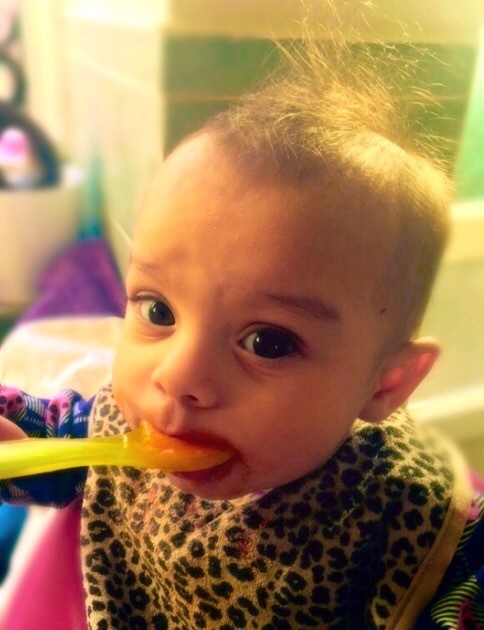 Interest in food – although most babies try to put everything and anything in their mouth at this point! Letting you know she is full – when your baby can turn away from breast or bottle to let you know they have had enough they are able to self-regulate and can tell you when they don’t need anymore food, otherwise you’ll be shovelling puree in them and accidentally making them overeat. We started my daughter with her first tastes on daddy’s birthday (so sentimental, I know!) she was just over 5 months and showing lots of interest in food (plus all the above), so it felt right. 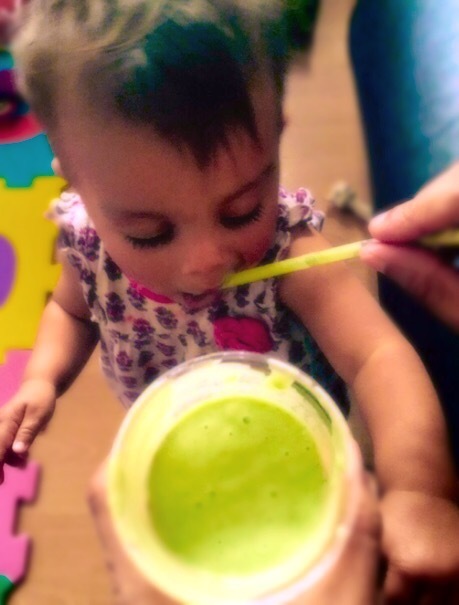 I started her on an avocado and pear purée, which she loved! At first, for softer foods the Anabel Karmel bowl and masher was all I used – and its fab for those first tastes. When introducing solids you should try a new food for 4 days in a row and then move on to the next food, that way you can see if baby has an allergy to anything and how their body and digestion responds to a certain food. Always start a new food early in the day, just in case there is an adverse reaction, you will be able to go straight to your GP to get it checked out. Try and avoid the mass-produced packaged baby foods if you can and stick to whole foods, nutrient rich, anti-oxidant full and the best start for your baby’s development. Some great choices for those first tastes include Avocado, Bananas, Pears, Organic Brown Rice and Sweet Potato. Avocado – a great first food for baby, avocados are loaded with essential fats and nutrients perfect for growing babies. They are easily digested, puree like a dream and most babies love the taste! Bananas – Sweet and creamy when mashed, its unlikely to be spat back in your face when first offered to your baby (unlike pureed broccoli – but that story is for another day!). It has been found that bananas and their mucosal properties actually help coat the tummy and help aid in digestion – win win!!! Organic Brown Rice Cereal – Most health visitors in your local surgery will often recommend baby rice as a first food but baby rice doesn’t neccesarily have to be your babies first food, pediatrics are now recommending bananas, avocado and sweet potato as perfect first foods. Rice cereal does add a great source of nutritious whole grains and fibre to your babies diet and you can find organic brown rice powder in most health foods shops. Pears – Another yummy baby fave, just simple steam and mash or puree straight up. You can also find organic packaged pear puree in supermarket now. Sweet Potato – Great source of lots of nutrients and combines well with both fruits and veggies, sweet potato is my go-to complex carb for my little lady and for me! This is a hotly debated topic between my mummy friends on the Island, Are we over-feeding or under-feeding our babies??!? Unfortunately none of us really will ever know for certain the optimal baby nutrition intake for that particular day, time or situation but trust your mummy gut and go with the cues your baby gives you. Don’t force that last spoon that we are told to offer if baby is pushing or turning away, this may confuse their natural ability to self-regulate his or her feeding by continuing to try to feed your baby – baby knows best in this situation! When offering a new food and it’s refused straight away it is advised to keep trying that particular food a few more times as it may take your baby a while to acclimatise to a new taste; but watch out for any reactions just in case baby is refusing because they know instinctively it won’t agree with them. 3 meals a day – Meals at this stage should including a grain, fruit, veggie and a meat or protein source such as eggs. When I started to introduce more root veg and harder fruits, I would steam and then use my Vitamix to purée. 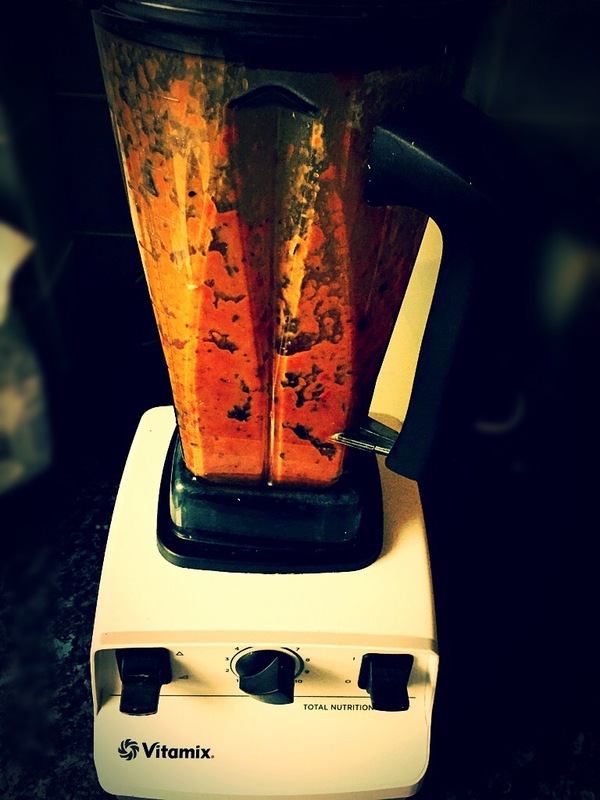 The Vitamix is a great gadget in the kitchen – it is incredible for making the most nutrient rich shakes, indulgent frozen cocktails, smooth spice pastes and even chops my onions for me. But at making baby food in small fresh batches daily it does not work quite as well. My hubby actually surprised me with the Avent Steam and Blend and I was hesitant to use it at first, struggling along with my big pans, steamers, and blender. I actually left it in its Amazon packaging for over a week. Well that was until I opened the box and my whole baby food making life got a whole lot easier. The Avent Steam and Blend looks like a mini chopper but my oh my is it so much more. You add in your veg/protein/fruit to the main container then add in your water to the base unit and flick the switch. Your chosen produce will steam to delightful perfection and when done you literally just flip over the container and pulse the button to blend to purée smoothness. A voila, it’s that simple. Healthy, fresh food that you can produce for your child daily. Baby Weaning just got a whole lot easier! Bon Appetit Babies and Happy Puree-ing lovely mummies!!! The word baby, like wedding, signals a time of major consumption. When pregnant you find yourself being sold just about anything and everything. Well, at least I did. But then I am one of those people who gets tempted by the chewing gum and dying flowers being sold at the front of the till. Not only is having a baby an expensive game its an absolute minefield of gadgets, gizmos, toys and teethers. There are 100’s of different types of teets for a baby bottle, fifty or so different types of nappy cream and then you have to consider if you have a sleeping bag or swaddling kind of baby. If you are a disposable diaper or Eco-friendly reusable nappy kind of parent. The choice is epic and it can all be very confusing. With babies and parenthood, you really have to trust your instinct with just about everything – every child is different and only you can decide what is best for your child. But when it comes to baby buys there are a few things I found that really helped us. So, in the interest of parental guidance I will happily share all the baby buys that we couldn’t have done without in those first few months and even still now. My ultimate newborn baby-buy is definitely the Cocoonababy. It is an ergonomic portable foam baby mattress. It was initially created in France to be used in hospitals for premature babies, but the clever people at Red Castle have created a larger version which is brilliant for all newborns. We absolutely loved that it could be used anywhere and everywhere, we used it in a regular swing crib, in the middle of our bed, on the floor, in the pram just about anywhere that had a flat surface (although guildlines recommend that it be kept in a standard Cot). It meant that baby could enjoy peaceful sleep time anywhere and didn’t limit me to being stuck in the bedroom watching Netflix and eating chocolate – although in the early days that is pretty much just what I did. The Cocoonababy is designed to help with reflux and colic due to its shape which supports the babies head and lifts their knees up to aid digestion. You are supposed to stop using it at around 4 months when the baby shows signs of rolling over, sitting up but we managed to keep our skinny minnie in it a little longer and I was dreading the transition to a flat mattress. Thankfully, she was fine. When your baby is first-born you find yourself spending copious amount of hours shushing, rocking and lullaby-ing. You will pretty much try anything to coax them back to sleep. To save your voice cords and patience I would totally recommend the Prince Lionheart Bear. It’s a cute teddy bear that comes with the most brilliant portable little sound machine. The sound part fits in to the palm of your hand so can easily be taken when you are out and about and nestled in to your pram. It also has a sensor so if baby wakes or cries in the middle of the night it will turn back on and do the shushing for you. You can even record a cute message to play to your baby, which is just fun quite frankly. I think it makes a great baby shower gift too priced just under £30 and the teddy is great quality and super cute. As much as my little one loves my iPhone there is another mobile we couldn’t have done without in the early months – the rotating lullaby singing kind that every baby crib is incomplete without in my humble opinion. I was actually recommended this baby mobile by my local baby store, Just Kidding. It was given to us as a baby shower gift by some friends and we seriously couldn’t have done without it in those first few months and even now my little lady still loves its cute animals and calm inducing melodies. The Tiny Love Magical Night Mobile, is super cute – it’s a nightlight with an overhead canopy projector and also projects stars on to the ceiling, as your child grows it can be made in to a night-light that stands upon a table; you can also detach the animals and use them as pram toys later on. I think its great to have a nightlight or a wall projection to help your baby follow objects and train their eyes to look further. It’s also super sturdy so I’m hoping it will see us through to the next child at least. Baby Bathing was the most daunting processes for me, I was so worried about her slipping out of my soapy hands. Luckily, we avoided all underwater experiences until I decided to pay for the pleasure with her WaterBabies lessons. I had received the Angelcare Baby Bath Support as a baby shower present again and only started using it after a few months. Initially, I used the sink for my little lady as she was just so little and then a traditional separate plastic baby bath, but found that you had to hold up baby while soaping rinsing and trying not to drop them all at the same time. The bathroom was always a soggy mess and so was mummy. This bath support goes in to your full size bath, you fill it a 1/4 full and place baby on to the support. 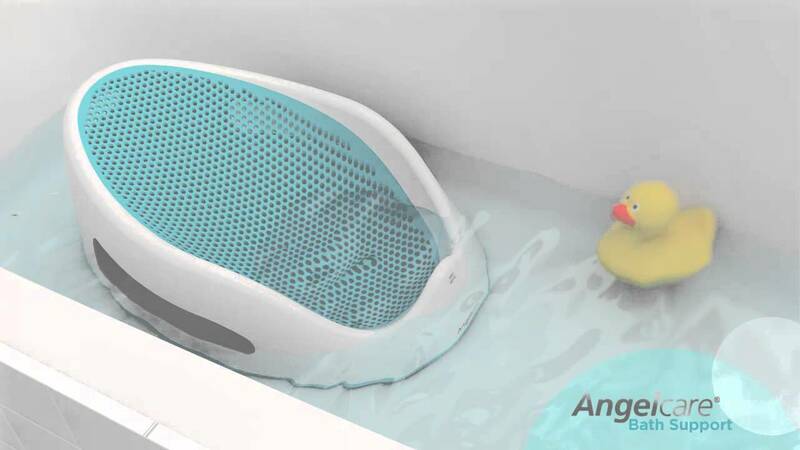 It has a brilliant silicon mesh panel in the middle which ensures all the soapy water drains away from your baby’s body whilst retaining the heat of the water and ensuring a slip free bath time. It has been a god send, I can actually play with her in the bath, make sure she is properly washed and remain perfectly dry. Every baby household needs one!!! Baby wearing has had a bit of a renaissance in recent years. The historical practice of using a piece of material to attach your baby to your body is as old as time, and is a super easy way to be mobile with baby. There was a vast number of differing methods of baby wearing throughout the world – woven wraps in South America, coats with pouches in Alaska, mei-tais in China and unbelievably nets sacks suspended from the forehead in Papua New Guinea. Nowadays, we tend to consider fewer options; sturdy ergonomic baby carriers, ring slings and a number of wraps. As with everything baby related the choice again is monumental so I would suggest finding your local sling library and going along to try what works for you, it’s also a great way to meet some local mums. I however went through the trial and error of buying without trying. I started with the Hana Baby Bamboo wrap. This felt amazing and was essentially an incredibly long long piece of cotton you origami on your body for baby safe-keeping. I always got myself in to a faff, so that was returned. Next, the ominous Baby Bjorn carrier. I had the original version as I borrowed my sisters and found this way too taxing on my poor shoulders. The Goldilocks for us was definitely the Beco Gemini, it has an added belt around the hips that supports the weight of baby across your body so is a better option ergonomically. My little lady absolutely loves the Beco, she’s so close to us and high up so it’s great for exploring and bonding and she’s had some pretty major naps while attached to her daddy! I would definitely suggest trying a few out once baby is here as you will only really know then what works for you and for your baby. Prams are a pretty personal thing, like cars. You maybe a sports car kind of driver or electric car kind of driver, or an anything from A to B kind of driver. Currently, the trend seems to be all about the bugaboo – you see them everywhere and everyone I know has one. However I fell head over heels for the Icandy Peach 3 in Truffle. I initially loved the Stokke and the Joolz was pretty nice too, but I guess I am just like an american rapper and all about the bling! The peach3 is pretty heavy in fact one of the heaviest on the market and folds in to two pieces, but it is so sturdy and great to drive. Its been through the mean streets of London, to urban farms and lots of public transport and it has stood up well in all conditions; with the bonus of being able to convert into a double buggy it makes sense long-term too. My little lady loves the pram and falls asleep very peacefully in recline, whilst in upright position I can even feed her at the table if we are out and about thanks to the new boosters they’ve added. I would suggest visiting your local John Lewis department store and booking in for a nursery advice session. Not only do you get to test drive the vast choice of prams available to your heart’s content but they will go over all baby essentials and even treat you and your partner to a coffee and cake afterwards. Who can say no to free cake? For absolute yumminess my fave place to head to on the island has always been Roka (especially with their fab weekend offers – another great perk of being an Island-er) but with Sticks and Sushi opening up in Greenwich recently , I think we may have some contention for the top spot locally. 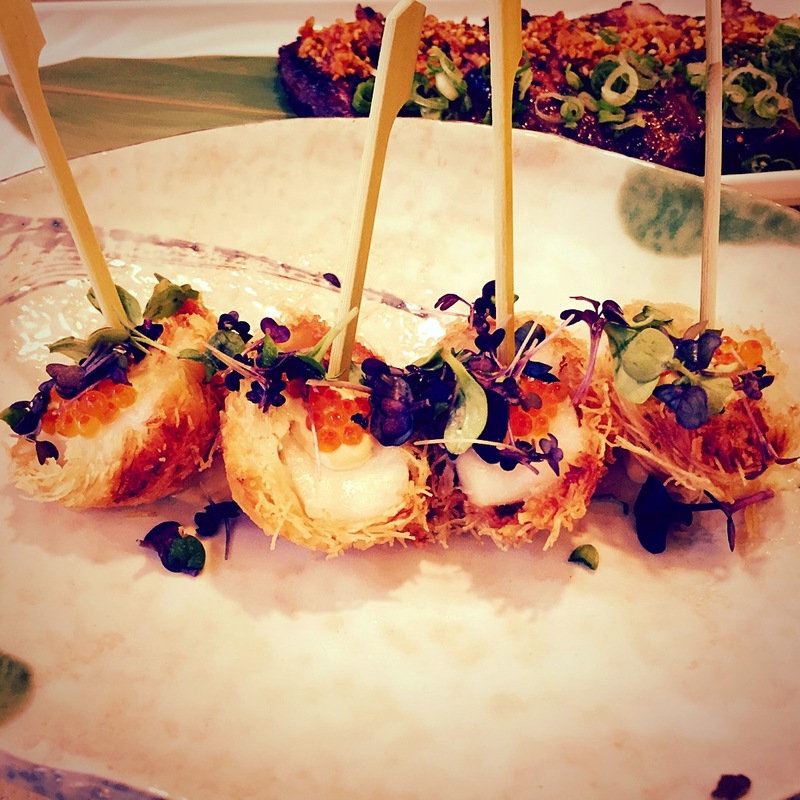 I first visited Sticks and Sushi Covent Garden in Jan with some yummy mummy friends and they did well to accommodate our 4 prams around a huge table in the middle of the restaurant on a Friday lunch. The Greenwich location has a relaxed low lit entrance with a few large tables, it seemed like the perfect place for an almost asleep baby. However, we were unfortunately seated in the windowless central part of the restaurant with bright white walls and lighting that led to a very awake unhappy baby. When booking, I would definitely recommend asking for a table near the front to ensure peaceful baby time. Regardless the food was delicious. The menu is more of a picture book, gorgeous glossy pictures of sumptuous sushi and juicy cuts of meat and fish – it makes you want to order everything and we almost did. First, lets talk sticks. The sticks are delicious and perfect bites that you order individually so you could, if really hungry, try them all. Ok, that’s maybe excessive but my hubby certainly did attempt to try as many as he could. 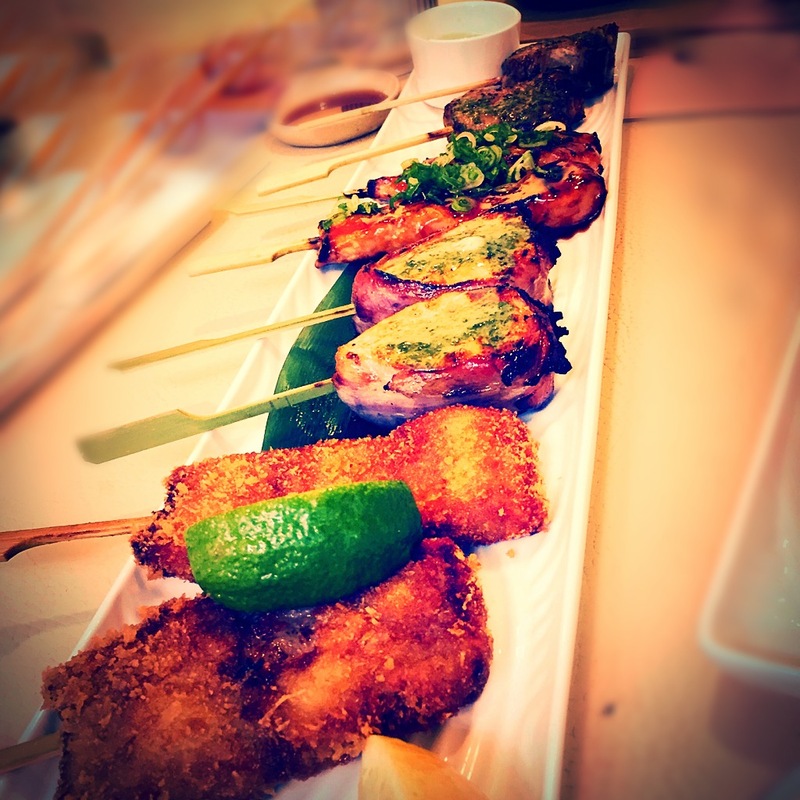 The picture on the left starts with Panko breaded Duck with caesar dressing, Salmon wrapped in smoked bacon with miso herb butter, miso marinated salmon and finally lamb chop with miso herb butter. The duck was melt-in-your-mouth tender, the added lime made the flavours pop. I love any kind of lamb and especially when it’s perfectly pink. The first time I had this in Covent garden the lamb was pretty good but this time it was just ok. Roka is still my favourite place for lamb chops – the Korean spiced morsels of deliciousness are just the best ever. The sushi was delicious. 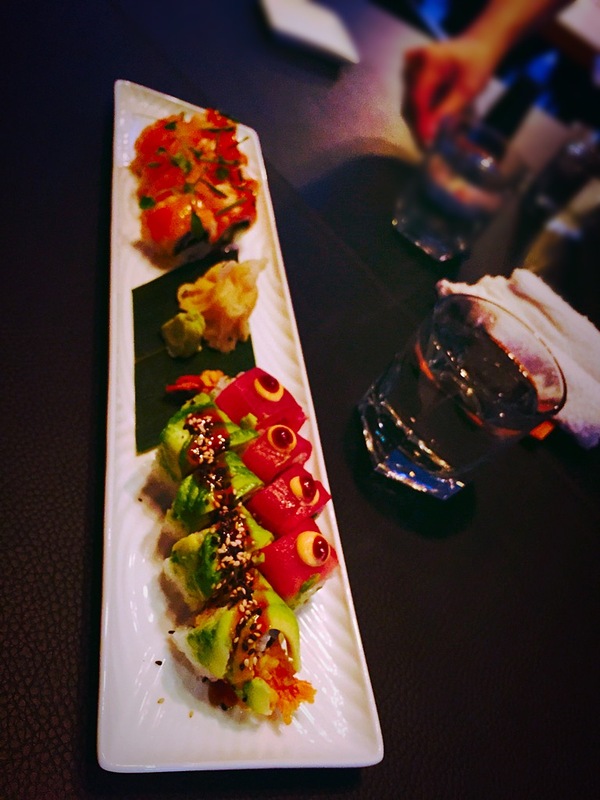 The Kaburimaki (topped rolls) are not only gorgeous but taste just as good as they look. My fave rolls, were Hells Kitchen and Salmon Ceviche. The latter was fresh and zingy, the salmon über silky with a great crunch of red onion. The Hells kitchen, is tempura shrimp topped with tuna and spicy barbecue – it was so damn good and I normally don’t like tuna anything. The hand-rolls were too dense for my liking but the tempura shrimp inside was delicious with a super crispy panko crust. We tried the Kataifi scallops with miso aioli, I wasn’t keen on the trout roe garnish but the hubby thought they were yummy. The standout dish for me had to be the ribs. They were so moreish; spicy, sour and candy sweet with a delicious burnt garlic sesame crunchy topping. The meat fell off the bone it was so tender, my mouth is watering as I type. I think I will have to pop in soon just for a plate of them and a bowl of my new fave drink – iced matcha latte. Sticks and Sushi serve matcha in these amazing huge terracotta white bowls (see below), you have to sort of slurp it out as delicately as you can. The dessert menu is a selection of bento boxes or you can pick and chose the elements you want to try. We decided to share the white box, we swapped out the yuzu curd for the chocolate marcel cake and glad that we did – it was the best one. The little light refreshing tastes were perfect after the copious amounts of herbed miso butter and sushi rolls. It’s a great place for good quality interesting sushi, yummy anything-you-can-imagine yakitori sticks and delicious ribs. Seriously, the ribs are so good. An aspiring tiger mom myself I have my little lady at classes everyday and why not when the choice of classes is so phenomenal for such a small area. There is everything from yoga to sign language to mandarin lessons for the babies of today. I have reviewed a few of my faves for you below. Yogabellies is an institution on the island with just about every class you can think of. There is antenatal, mum and baby yoga, baby massage, yoga kids, yoga belles, monthly lunches and the occasional girls night out all run and organised by the fabulous Sharon. I first met Sharon last year when I was about 16 weeks pregnant and started off with her Friday night prenatal class. I never thought I would be giving up the ubiquitous after work drinks for the yoga mat, but I did and so happy I did too – even now, I miss the Friday night zen aura I had walking home from class. 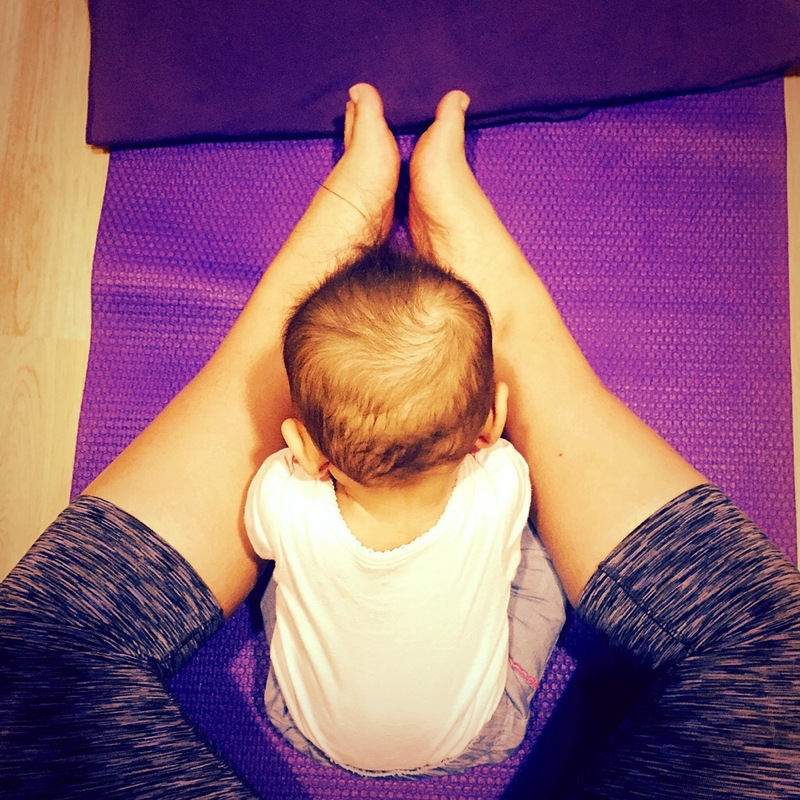 The mum and baby yoga is run on Friday afternoons in the Barkantine Center and is a gentle practice for you to enjoy with your little one. The class starts with a personal highlight sharing every week, which is great because sometimes you just need some advice, which always generously offered by Sharon and the other mums, we then have some singing and stretching for the babes and there are simple poses and sequences you could easily learn and repeat at home. Then there is mummy practice and we end with a calming mantra and affirmation. My little lady is always fast asleep after class and just as well as we always tend to go for post yoga coffee and cake, we are a social lot here on the island aren’t we. You will find yogabellies mums everywhere and everyone knows Sharon, we go for lunches monthly and nights out too, so it is way more than just the classes – it’s a mummy network! You can contact Sharon at Yogabellies or check out her Facebook page. Sing and Sign is a great class and has been proven to advance speech development. The class is run across the borough by Sukie and she offers trials if you’re not quite sure if it’s for you. The class is a singing extravaganza and teaches your baby everyday useful signs to go along with popular nursery rhymes. I find myself singing the songs across the week to my little girls delight. 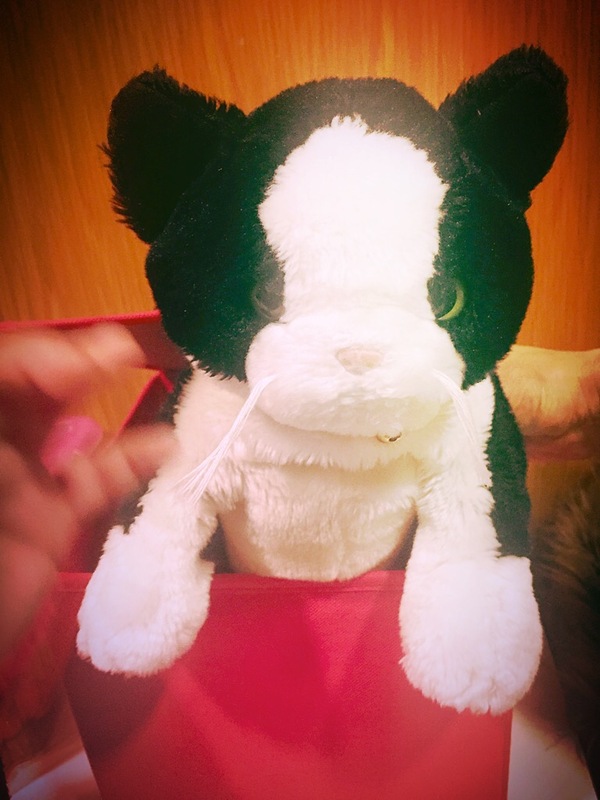 And there’s a very cute postman pat-esque black and white cat called Jessie that my little lady tries to grab every week. Jessie even has his own FB page and is running the London Marathon this year too! My fabulous nearly 2-year-old niece started making actions when we would sing nursery rhymes to her, we all assumed it was something she had picked up in nursery but lo and behold she was actually signing every single step and had picked it all up from the sing and sign DVD that she would watch completely mesmerised. I’ve seen developments while in the class with my little lady, even at the initial taster at 4 months she started blowing raspberries and we nearly had her crawling in class last week, so it’s one class I really do recommend. The classes run on Tuesday mornings in a new gorgeous location in Burrell’s Wharf and you can contact Sukie for more info on her FB page she runs a number of classes throughout the week across the borough. Waterbabies is one of the more expensive classes available but also one of the best in my opinion. I absolutely love the water so want to make sure my little lady is more than comfortable poolside. Classes are held all across the country in hydrotherapy pools in schools, specialist facilities and even hotel swimming pools. The classes are roughly 30 minutes and start with a warm up, lots of jumping on your part, a few underwater moments and plenty of splashes. It is pretty daunting when you first have to dunk your baby in the water, it feels sort of unnatural but you soon see how easily they take to water – these babies are a lot braver than we think. My little lady can be screaming down the changing room but the minute her tootsies hit the warm water she is as happy as a cupcake. Lets not even get started on “splish, splash, splish, splash, around in a circle and up in the air” – that little mantra can calm her down even on dry land!! Swimming is great for your baby’s health and development, it stimulates heart, lung and brain development. 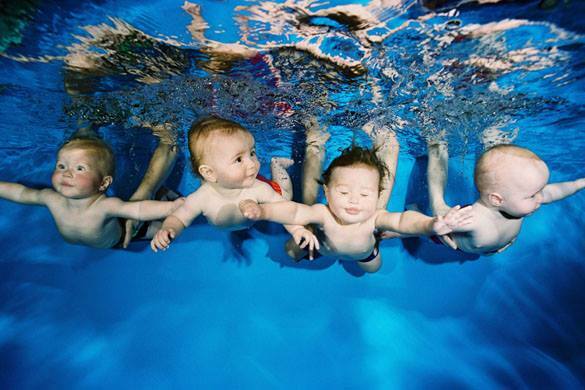 A German study even found that swimming babies had advanced motor development, social skills and intelligence. I clearly recommend the classes and the facilities at George Green School near Island Gardens Station are fantastic, the pool room is warm and cosy and the babes have the best naps after swim class. For more info on Water Babies locally visit the NE London page for all classes in the Docklands and Isle of Dogs area. Baby Sensory is brilliant but can be pretty intense especially for the younger ones. We took our little lady to a Christmas special and I guess she must have been the youngest at just over 3 months and I think it was far too chaotic for her – bubbles, balloons, blow up christmas tree’s, tinsel galore it was confusing even for me. However, at 7 months we got the chance to attend another class with the NetMums group and it was just brilliant. Anna leads the class across the borough, she is engaging and obviously very creative. The venue is not the most charming but once the class gets started you could be anywhere. The theme for our class was under the sea and I assume Anna must create these magical tinsel laden canopies (see picture) for each class or theme. She started off with a lovely welcome song that uses sign language, this is the same every week so that you will learn and pick up some basic signs. Then there was a succession of different songs with a sensory object, for example rattles for sound, coloured scarves for sight, tinsel pom-poms for touch. 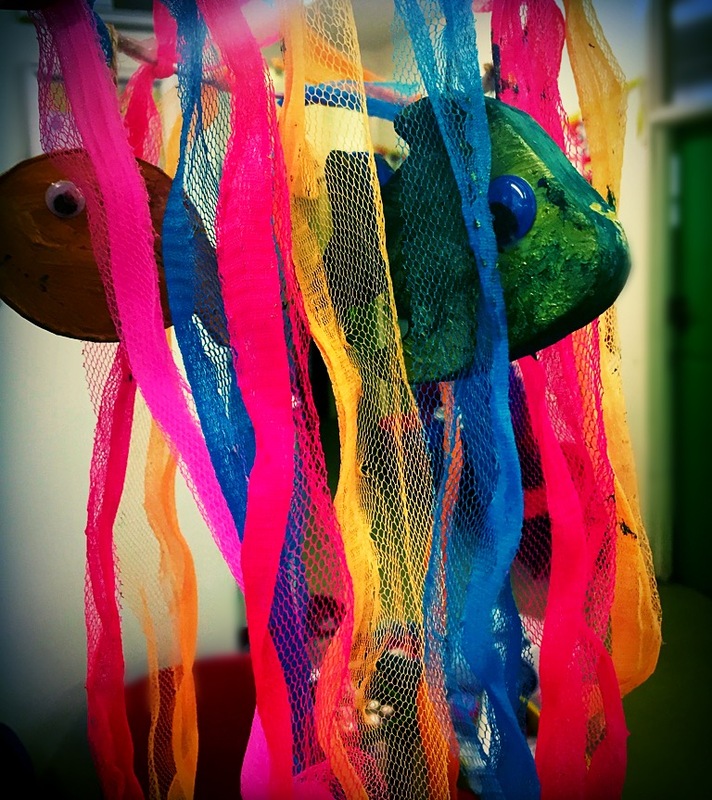 The pinnacle of the class was the underwater canopy of bubbles, tinsel anemones, glitter fish and a foil coral reef. There are classes across the borough and Canary wharf class has just started this year but with demand so high the places go quick. You might not get as much out of the class if your baby is too young but I would definitely recommend a trial to see if it’s for you and your baby. You can find out more about Anna’s class and try out a free taster yourself by visiting The Baby Sensory website. Not to dwell on the subject having already written a whole post on it, but The Creation Station baby art classes are the highlight of my week. It’s a fun, social class with a major competitive twist – that being all us mummies attempting to create best in show every week. The paints are edible and I assume incredibly tasty by how much is eaten every week. The class is great value, we create a take home item every week and I am super impressed by the quality of the supplies we use. Last week, we made these rather fetching fish mobiles and for mother’s day gorgeous hand print canvases (see our Tree creation below) that I can’t wait to frame and hang up in my little lady’s nursery. Julia, who runs the class, offers a great buy one get one free taster so essentially you get to try two weeks to see if you really like it. This term, we have explored colours and we move on to shapes next term and its great for building not only creativity but developing hand-eye coordination too. The classes are held south of the river in East Greenwich but it is really easy to get to on the DLR. To get your creative on get in touch with Julia at The Creation Station website. I have also reviewed Gymboree in a previous post, but feel it deserves a mention as they have so many options for pre-schoolers and its also a great venue to host a party on the island too. The Gymboree in E14 is based at the top of the island closer to Blackwall DLR and Poplar. Gymboree have a number of classes including baby sensory, play and learn, music and arts. My little lady loved the session and it was the first time she started attempting to crawl. The highlight was definitely the magical non popping bubbles they have (and sell too apparently) – amazing fun for the mummies too. What I love about the set up at Gymboree is that you can buy a flexible package and attend when you want across 3 months, we never know when our baby will be ill or you just can’t make it to class – sometimes you really should not wake a sleeping baby – trust me it’s not pretty. For more info on Gymboree check out their docklands website and sign up for a free trial. The serenity of a spa is a long world away from my new normal of late night feeds, nappy changing and teething baby drama. So given a quick break by my hubby for some me time was an absolute dream. But when I mean quick I’m talking 40 minutes, clearly not enough time to indulge in a spa day… So I brought the spa day to me!!! I received a delightful gift set from one of my lovely sister in-laws recently, the Temple Spa – Spa Retreat Discovery Collection. Temple Spa is a company founded by the husband and wife team that took The Body Shops Colourings brand from a turnover of £4million to £124million they also created and launched the Virgin Vie brand for Richard Branson. Temple Spa was born as their own baby after inspiration from travelling the Mediterranean and wanting to create a niche brand that evoked the principles of retreat and restore. The collection comes in gorgeous packaging, a beautiful box with the most brilliant concept. Inside the gift box along with 8 bottles and jars of magic potions there is a card that details “15 steps to create your own spa, wherever you are”. This innovative concept takes what looks like a normal gift set to a whole new level and prescribes a recipe for utter relaxation. I’m more of a hot shower kinda girl than a lounge in the bath for an hour kinda girl, I cannot stand it when my fingers go wrinkly, yuck! So I adapted the process to suit me and changed a few of the steps around, but it was just the relaxation I needed. The quality of the products is outstanding – no wonder Harrods bypassed their usual 3 year wait list and got the products on their shelves within a week of being introduced to them. They all smell delicious, are super rich and my skin honestly feels lovely even a day later. As per step one, I carb-ed up with my late lunch of supposedly “gourmet” pizza from my local Firezza, ran the shower at max to steam up the room and created a spa like ambience by lighting my new decadent Lelo Vanilla and Creme de Cacao flickering massage candle (Available at Selfridges). I used the Be Gone kind-hearted Cleansing Lotion first and as I couldn’t find my organic cotton face towel, a bright orange baby muslin would have to suffice. The cleansing cream is rich and soft and I instantly felt refreshed, it is made with aubergine, liquorice, cucumber and basil. The creme has an overwhelming smell of lavender which just took me straight back to making a heart-shaped lavender pillow for my sewing badge at brownies when I was 9. Regardless of the random flash back I was suitably relaxed and ready to start my “at home spa ritual”. Next up was the delicious Breakfast Smoothie exfoliator that is just edible (not literally), its unctuous and delicately grainy. You are supposed to leave this on for ten minutes so after a quick massage in to my pores I hopped in the shower and used a little bit of the Drift Away Relaxing oil on my skin, the smell of Jojoba, frankincense and patchouli coupled with the candle light, the veil of steam and Tibetan healing sounds on YouTube lulled me right in to a false reality of actually being in a spa (just need to pretend the baby bath and laundry bag aren’t there!!!). Having not read the next step properly, I was supposed to put the face mask on before my shower and use cucumber slices on my eyes while languishing in the bath. Instead, I decided to lay on my bed for a few minutes with a towel over as if I was waiting for a massage therapist to walk in and knead out my muscles, however, she did not appear so I went on to the next step! The Becalm Soothing Face Mask feels like a uber rich moisturiser, on putting it on I had to double-check that I hadn’t mixed up products as it seemed to just sink in to my skin rather than lay on my face and pull it tight like most traditional masks tend to do. You could actually feel it instantly plumping up your skin, much what I imagine a collagen shot would do to your cheeks but without the need for medical grade needles thankfully. I have never much cared for toner after almost burning my skin off with the wrong clique three-step programme when I was about 15 that I stole from my sisters make up bag. However, given that the ingredient list reads more like a salad than a beauty product the Toning Essence Essential Mist Toner is gentle and light with an orange blossom fragrance. It includes lemon, lime oil, lavender, tomato, bitter orange, basil, mandarin, melon extract, rosemary, rose geranium and sweet orange. You seal the moisture in with the Be Still Settling moisturiser, it is marketed as liquid velvet and I think it would be great under make up with no need for a primer. Step 10, was quite a challenge – my hair is notoriously knotty and I loathe brushing the knots out but this step actually requires you to brush your hair for two minutes. After hacking away with my detangling brush the process of simply brushing my hair through was utterly relaxing and my hair is silky soft today but I credit that to the new Elvive Fibrology shampoo that I’m currently using – super cheap and much better than the Toni and Guy stuff I was using before that is literally 10 times the price. At this point, I could hear hubby and baby lingering outside the door to hurry up as they both needed feeding so I briefly massaged in the Aaahhh! Soothing Balm for Aching feet and limbs which I could still feel tingly away while little one was devouring her avocado puree on my lap 10 minutes later. I finished up with the Repose Aromatherapy Resting Cream. Packed full with vitamins galore, bitter orange, black pepper oil, geranium it literally relaxes you in to a tranquil daze – it was the perfect ending to my few moments of Home Spa bliss. Now, I just need to get my hands on the coveted award-winning Skin Truffle moisturiser to continue my new obsession with Temple Spa. And I think my mini Me is a fan already, I found her trying to eat the gift box this morning!!! No I am not talking about pina colada’s, white sand beaches and tropical heat (if only), the island I am referring to is that of dogs. I have been partially living in North London since my daughters birth while my house gets renovated, so I was somewhat out of the mummy social scene here on the isle of dogs. However, in the last few weeks I have met so many fabulous mummies and got the run down of what’s what and what’s hot here in E14. With every new mum I meet I hear about or am recommending a class, meet up, event that they or I don’t know about so thought it was only fair to share this information to all the new mummies in the area. This post will go through free classes and meets ups and a follow on post will detail a plethora of classes to keep you and your little one busy all week-long! There’s a great group I joined a while ago on Facebook called Walking Mums London. It was set up by a rather adventurous North London Mummy, whom I assume loves to walk. Anyone in the group can arrange a walk which goes out to all members and they can decide if they want to join the walk. I went along for the first time last week and given that they were walking past my house it would be rude not to. The day was brilliant and I met some lovely ladies and babies that I am already planning on meeting up with. Our walk started at the top of the wharf all the way to the Greenwich observatory, we even did the immensely steep hill up to the top (See picture for proof). It did completely exhaust me! Need to do more Pilates clearly! There are different walks across London all the time so definitely have a look at https://facebook.com/WalkingMumsLondon – today they are off to Kew Gardens. You didn’t think I’d forgotten about the daddies on the island now, did you? The fabulous people at the Idea Store Canary Wharf have put together a Saturday Dads Club. It’s story time for dads and their under 4s. The info can be found https://www.ideastore.co.uk/idea-stores-canary-wharf-activities-events. I’ve heard it’s brilliant for baby daddy bonding and gives the mummies a couple of hours of respite to catch up with friends, go shopping or even enjoy the luxury of an undisturbed shower!!! Who knew that post baby a shower in peace could be as zen as a whole day at the spa! Do share in comments or email me through any other classes and events you’d like me to feature. 6 months old and already going to art class. I fancy myself as quite the creative and being able to explore all things arty with my little doll was a chance I wasn’t going to miss out on. After getting incredibly lost walking around East Greenwich and turning up after the obligatory sing along that all mum and baby classes tend to start and end with we walked in to one of those make shift portable rooms that takes you right back to finger painting at primary school. Laid upon blue tarpaulin were black and white papers, paints, sponges and potatoes. Yes, potatoes. I love the idea of exploring your child’s arty side so young and introducing them to different colours, paints, and textures. The concept behind The Creation Station, the award-winning class, is to explore textures, colours and encourage development from an early age. Every week there is a different colour theme that is thought up and led by the delightful Julia. Today’s class had a black and white theme culminating in the creation of penguin puppets. I made a cross-eyed walrus, just to be different, but mainly because the orange teeth were already cut out, discarded and in the scrap pile plus I couldn’t find two matching googly eyes so a yellow and red one would have to suffice! The class was fantastic, the paints are organic and completely safe for babies. Just as well as most of them had been chewing on the sponges and paintbrushes by the end of the class, one kid had even drawn himself a rather fetching Santa beard with a sponge roller. My little madam thought it was more fun to scrunch the paper up and then rip it to shreds, followed by attempting to eat it. Oh so proud. She is at that age that everything and anything will be eaten or licked when she’s around, so I was happy to hear that the paints are edible too. It may sound pretty daunting to try at home but I would definitely recommend giving it a go. The creation station provide rather fetching red all in ones to protect the little ones clothes and you can buy these online from their online store http://www.thecreationstationstore.co.uk/l or http://www.muddypuddles.com stock similar overalls that are fleece lined so will also come in handy for rolling about in outdoors too. There are a number of washable baby safe paints available online or you could even try make your own by adding diluted food colouring to yogurt, condensed milk or a paste of water and cornflour. From there you can use vegetables, sponges, textured surfaces… Just about anything to get creative with. You will probably need an old table-cloth or sheet to protect your home from the chaos that will no doubt ensue but it will be all be in the name of art and fun, and you can’t get better than that. But if you happen to live near Greenwich or can find a Creation Station class locally I would definitely go for a trial and let you and your babies inner Picasso out! Next weeks class has a gold and silver theme… Liberace, eat your heart out!